y is the segment offset to that list. Follows the actors list format. rooms ? y is the segment offset to that list. Follows camera entries format. scenes ? Documented by Strati and mzxrules rooms ? Posted on z64 by xdaniel scenes No? y is the segment offset to the object list. Follows the object list format. rooms ? y is the segment offset to the list. Follows the lighting list format. 0x0D Pathways 0D000000 yyyyyyyy y is the segment offset to the path list. Follows the path list format. y is the segment offset to that list. Follows the environments list format. scenes ? y = time speed (signed), default 0x3. rooms ? z = Fog. 0 = minimal fog, 1+ = significant fog scenes ? y = Unknown, set to 01 in Z2_WITCH_SHOP_room_14. rooms ? 0x13 Defines the exit list 13000000 yyyyyyyy y is the segment offset to the exit list. Follows the exit list format. scenes ? 0x1A Defines texture animations 1A000000 xxxxxxxx x = segment offset to the entries. Follows the texture animation list format. scenes ? 0x1B Defines cameras and cutscenes used by actors 1Bxx0000 yyyyyyyy x = Number of entries y = segment offset to the entries. Follows the 0x1B entries list format. scenes ? 0x1C Defines the mini maps 1C000000 xxxxxxxx x = segment offset to mini map data. Follows the mini map format. scenes ? 0x1E Defines the chest positions on the map 1Exx0000 yyyyyyyy x = Number of entries y = segment offset to the entries. Follows map chests format. scenes ? The Spirit Temple in Ocarina of Time has two unreferenced headers in every scene and room, due to the alternate scene header command being absent. You can get the rotation value by shifting the p, w, and r values right by 7. The rotation flags are stored in the actor ID. if greater than, add 0xFE98 to value. Several actors such as En_Box (0006) and En_Time_Tag (01AB) use these flags. The entire set of spawn time flags is stored in the x and z rotations. r & 0x007F, then added to the "spawn time" var, giving us a complete mask of  & 03FF possible values. & 03FF is broken down into 5 groups (for days 0-4) of 2 bits (for day/night). Thus this actor will always spawn on days 0 and 1, the night of day 2, the morning of day 3, and the morning of day 4. This tells the actor what 0x1B entry it should use, and is stored in the y rotation. Each room is two pointers, start and end, which game searches for in the file system. This format uses the header slightly differently. e is not the end of the entries, but the ROM address of the JFIF image within the room. Following e are 0x14 unknown bytes, perhaps bounds of some sort. At the offset given by s are the display lists, in the same format as mesh type 0.
x = first (close) display list. Set to 0 if unused. y = second (far) display list. Set to 0 if unused. Each entry is a two-byte entry of the object number, of the game's object list. Objects are required to load any actors that are not object 1 or object 2 (if the area is not a dungeon) or object 3 (if the area is a dungeon). x, y, and z are the (signed) coordinates of the specific point on the path. For more information, see Cutscenes. 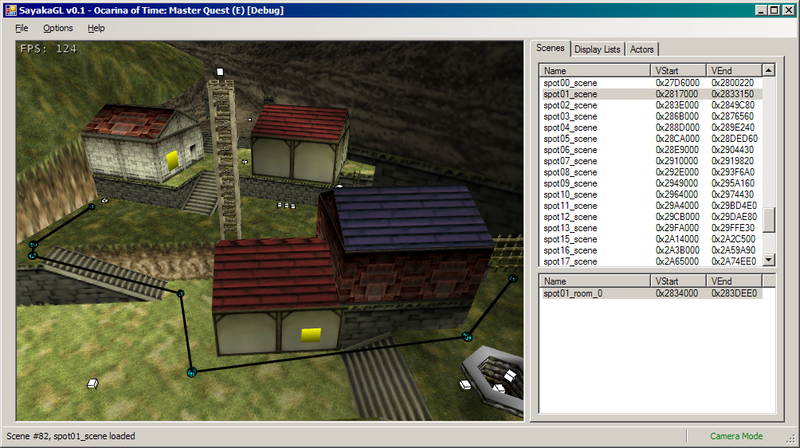 Each entry is a segment offset pointing to a scene header for the current scene/room. The number of alternate headers is undefined. /* 0x08 */ //next entry? At 801BD040 ram/00C749A0 rom is a table of 0xB records representing 11 different world map locations. Each record contains an 0x36 byte array of two-byte "internal" scene indexes (for a total of 26 scenes + terminator). To determine if Link is visiting a world location, each array is scanned for the current internal scene index. If -1 is encountered in an array, the next location array is checked. If a world map location is found, a flag is written to Save Context + 0x0F5C, otherwise nothing happens.